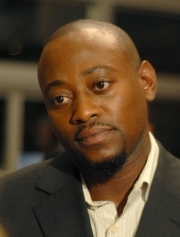 Omar Hashim Epps is an American actor, singer, songwriter, and record producer. His film roles include Major League II, Juice, Higher Learning, Scream 2, The Wood, In Too Deep, and Love and Basketball. Epps' television work includes the role of Dr. Dennis Gant on the US medical drama series ER, and since 2004 Dr. Eric Foreman on the Fox medical drama series House. Epps was born in Brooklyn, New York. His parents divorced during his childhood and he was raised by his mother, Bonnie Maria Epps, an elementary school principal. He lived in several neighborhoods while growing up (Bedford-Stuyvesant, East New York and Flatbush). Before he started acting, he belonged to a rap group called Wolfpack which he formed with his cousin in 1991. He began writing poetry, short stories and songs at the age of ten and attended the Fiorello H. LaGuardia High School of Music & Art and Performing Arts. Epps has a daughter, Aiyanna, from a previous relationship. He married Keisha Spivey from the R&B group Total in 2006. They live in California with daughter K'mari Mae and son Amir . Early in Epps's career, he was most often cast in the roles of troubled teens and/or athletes. He made his feature film debut with rapper Tupac Shakur as the star of cinematographer Ernest Dickerson's directorial film debut Juice. The film is the violent and tragic story of four young men growing up in Harlem. Epps followed up his performance in Juice as a running back in the college football drama The Program alongside James Caan. Epps starred in the film "Deadly Voyage" produced by John Goldschmidt for HBO Pictures and BBC Films, and won the best actor award at the Monte Carlo Television Festival for portraying Kingsley Ofusu in this true story about African stowaways. The following year, he switched to baseball as co-star of Major League II, taking over the role of Willie Mays Hayes from originator Wesley Snipes. His next athletic endeavor was playing a track and field star in John Singleton's Higher Learning, a look at the politics and racial tensions of college life. Epps landed a role on the hit television drama ER for several episodes portraying Dr. Dennis Gant, a troubled surgical intern. After his television work on ER, Epps returned to the big screen in 1997 with a brief turn as a giddy moviegoer on a date with a woman played by Jada Pinkett, who ends up an early victim of a psycho slasher in the blockbuster sequel Scream 2. Also in 1997 Epps was the star of the fact-based HBO movie First Time Felon. Epps played a small-time criminal who goes through Chicago's boot camp reform system and undertakes a heroic flood rescue, only to then be faced with the adjustment of re-entering society with the mark of ex-con. In 1999 Epps was cast as Linc in The Mod Squad. While The Mod Squad proved a critical and box office bust, Epps's later 1999 effort The Wood offered him a serious and multi-dimensional role. Following a group of middle-class African-Americans from youth to adulthood, The Wood, the debut effort from director-screenwriter Rick Famuyiwa, co-starred Richard T. Jones and Taye Diggs and received a push from co-producers MTV Films that ensured turnout of a sizable youth audience. Also in 1999, Epps was featured alongside Stanley Tucci and LL Cool J, playing an undercover detective who finds himself dangerously caught up in the illegal goings-on he is investigating in In Too Deep. 1999 also saw him lens the 1950s set murder mystery When Willows Touch, with James Earl Jones and Jada Pinkett Smith. In 2000, Epps starred in Love & Basketball, featuring Alfre Woodard and Sanaa Lathan. He portrayed Quincy, the NBA hopeful who has a stormy relationship with an equally adept female basketball star Monica . The actor held supporting roles in a series of films including Dracula 2000, Big Trouble, and the telepic Conviction. In this year he also had a leading role as a gangster in Brother, a movie by acclaimed Japanese actor/director Takeshi Kitano. In 2004, Epps landed the role of drug-dealer-turned-prizefighter Luther Shaw who falls under the tutelage of boxing promoter Jackie Kallen in the biopic Against the Ropes. Also in 2004, Epps returned to television medical drama with his role as Dr. Eric Foreman on the US Fox television series House. The role earned him a NAACP Image Award in 2007 and 2008 for Outstanding Supporting Actor in a Drama Series. Whole or part of the information contained in this card come from the Wikipedia article "Omar Epps", licensed under CC-BY-SA full list of contributors here.